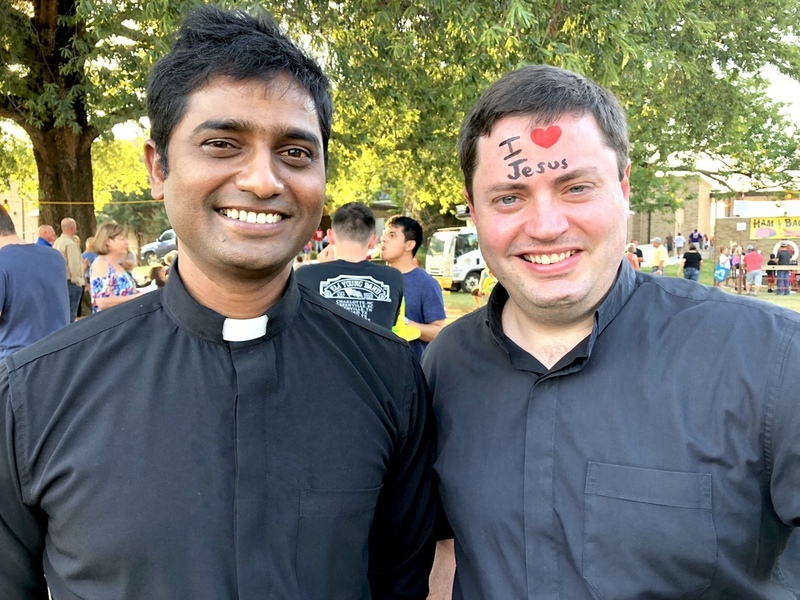 Father Tony, after visiting the Face Painting Booth, shows our new Associate Pastor, Father Chandra, around the Midway on Saturday night. The big news is that Tom Hambuchen won the Raffle Grand Prize of a 2018 Ford Edge SUV. An out-of-towner from Van Buren won the 2nd Place prize of a Yamaha Generator. The 3rd Place prize of a $800 gift certificate from McKinney Tire went to Jason Westerburg. The Raffle Row custom golf cart was taken home by Melissa Jerrell. Lisa Gamble won $500 cash. A $500 Strain Photography gift certificate was given to Lindsey Magie. A 22"x 18" painting by Steve Griffith will now hang in Robbie Davis' home. Steve Neil got a Konstantino sterling silver cross charm bracelet. Brandi Covington took home a beverage-filled cooler. The $2500 St. Joseph School tuition credit was won by Amelia Erstine. Tanya Downey received a $500 gift certificate from the SJS After-School Program. A $250 SJS book bill credit went to Nick Zopolos and Frank and Joann Mayor won a chrome book. So many great prizes courtesy of generous donors all to benefit St. Joseph School!